Point 1 – Ditch the door and save some dough. 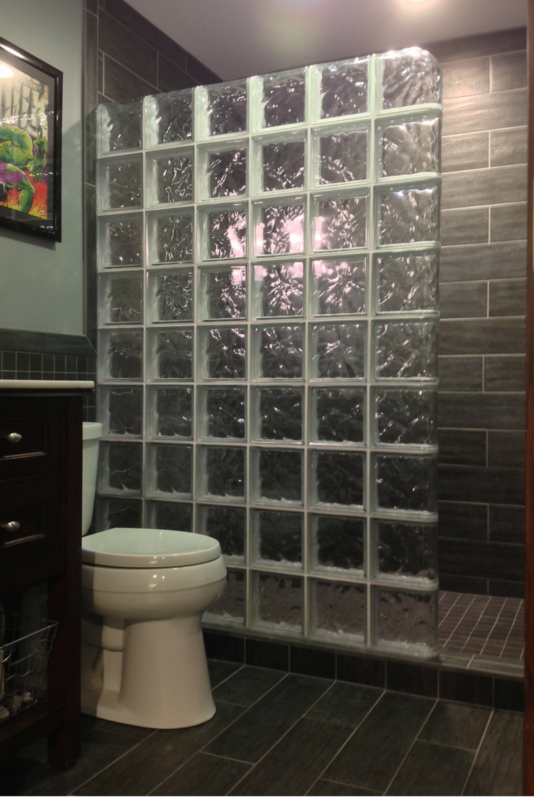 Glass shower doors, which are often used for a shower “enclosure,” can be expensive. If you choose a high-style 3/8” thick frameless system the door alone can go north of $1,000. If you go with the lesser quality framed door your home can end up looking like a cheaply built builders-grade home from the 1980’s. If you choose the low cost curtain option they always seem to build up dirt and grime and end up looking nasty. With the doorless open design you’ll save money and get rid of the problems above. The glass block shower shown below is also a breeze to clean. I wish I understood why the heck my body is made up of wear parts and it gets tougher to do what I did when I was 20. As a guy I can be dillusionally happy and pretend my mobility is the same as when I was in college by my trips to the physical therapist for my neck remind me this is not the case! My challenge with my neck is similar to what many experience as their mobility is reduced as they age. 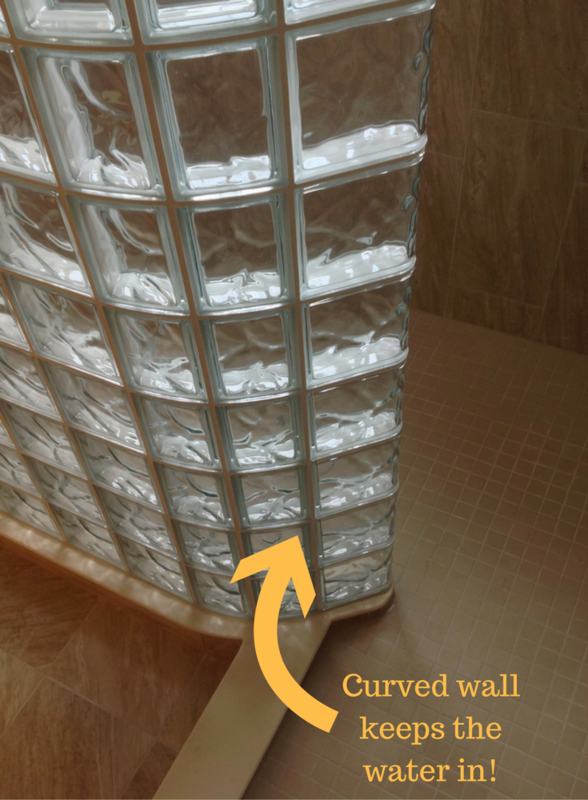 What’s cool about a walk in shower is you don’t have to struggle with the door – or better yet you can make a one level shower design to eliminate all the barriers to entry. We are seeing a huge growth in the one level and ramped in shower entry designs as more people are caring for aging parents and/or are just trying to plan ahead with sound strategies to stay in their homes longer. The simplicity of tiny homes and dressing like Mark Zuckerberg and Simon Cowell are in! Why you might ask? I think it’s partially due to the fact our lives are too complicated and most of us are desperately searching for ways to make things simpler. Whether it’s in fashion design (Simon Cowell and Mark Zuckerberg wearing black shirts all the time), home design (tiny homes, container homes and houseboats) or shower design (a simpler shower without a door) the desire for cleaner, easier, less complicated design is on the rise. 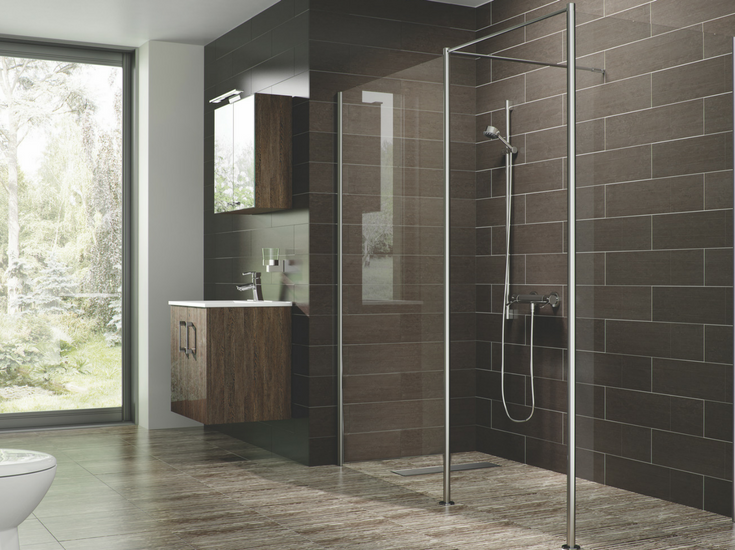 The walk in shower is simple because it has less moving parts (no doors or curtains) than the shower enclosure. This is a point which most people living in the United States don’t understand initially. You can have a walk in shower in a bathroom in a really tiny bathroom. Most people assume you need a lot of space for a walk in. If you live in Europe and Asia (where homes and apartments are smaller than in this country) they know otherwise. 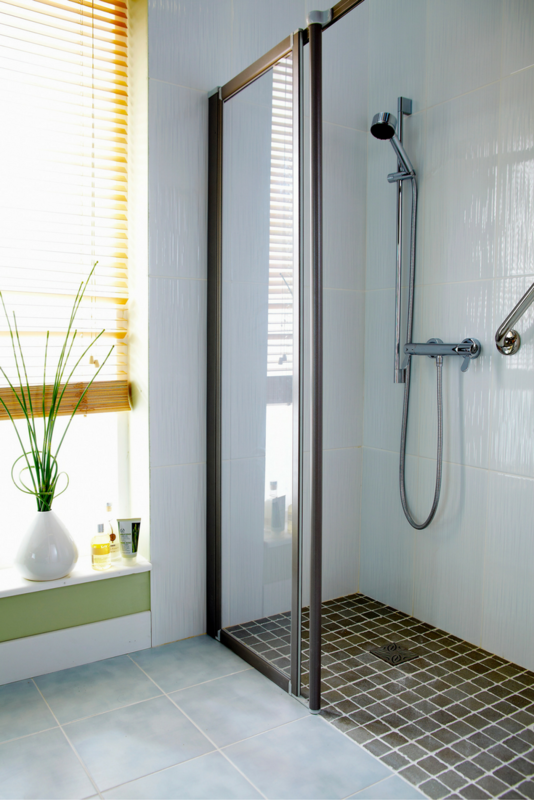 With the use of an open one level wet room system your shower and bathroom can be one continuous space. 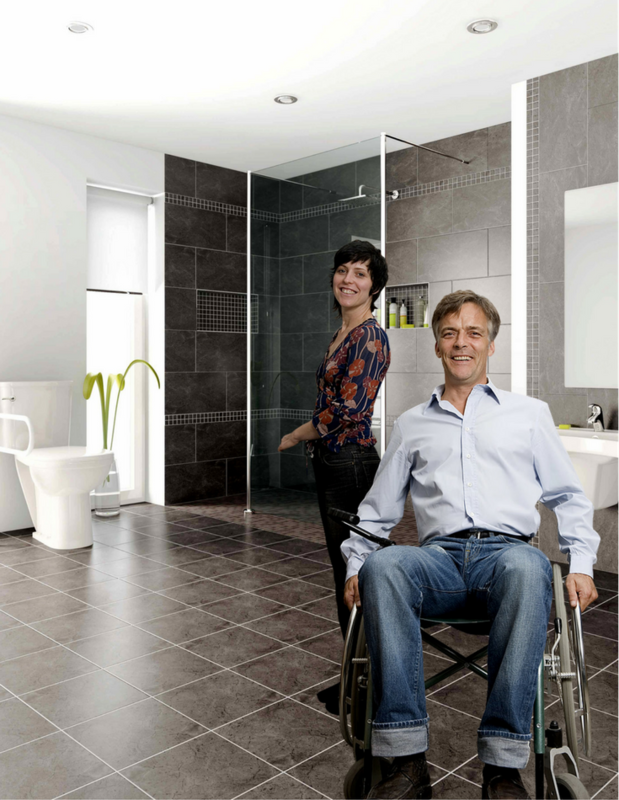 This one level wet room not only works well for someone who needs the assistance of the wheelchair, but it’s also a big benefit when you’ve got a tiny bathroom. OK – the fans of the walk in shower have had their say – now let’s give some ammunition to those people who just aren’t fans of open designs. 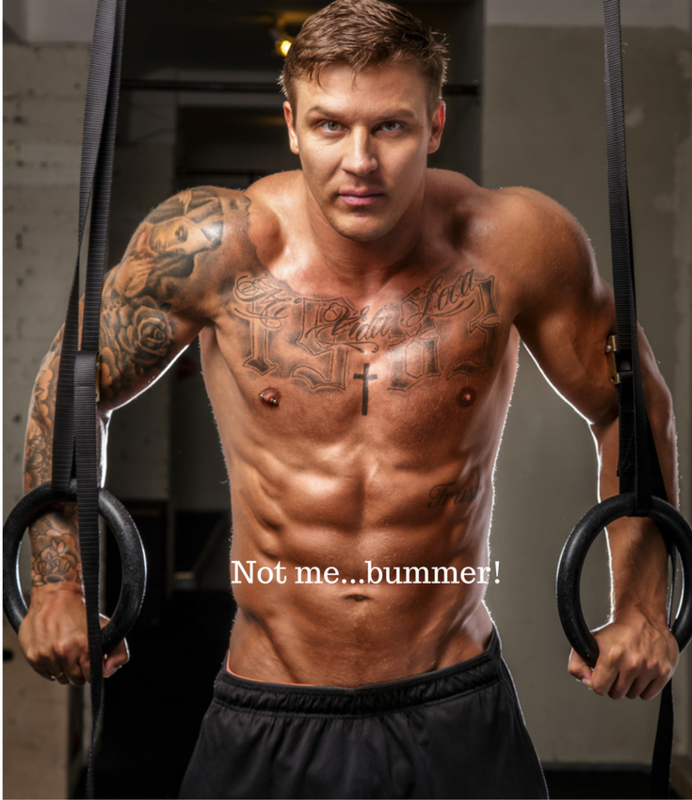 If our bodies matched those of famous fitness instructors and athletes we might want the shower completely open. For most of us that’s just not the case! 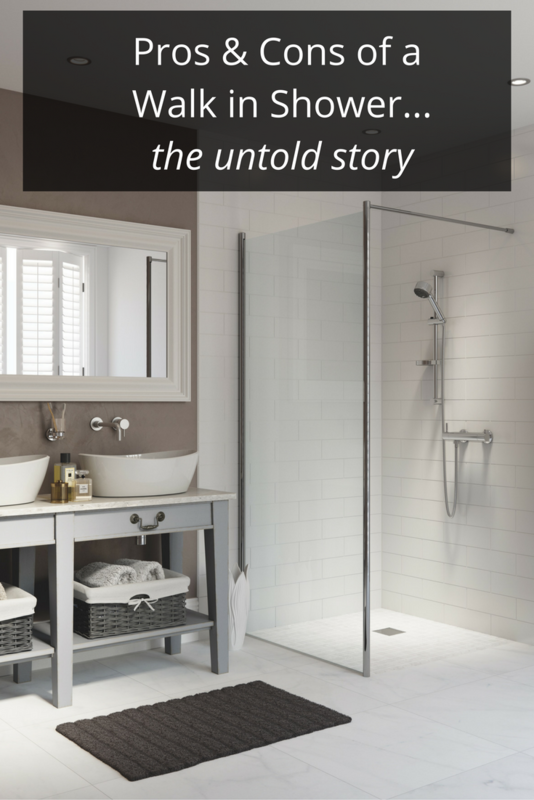 Given this fact the shower enclosure with obscure glass or glass blocks can be preferred because it offers more privacy (sidenote: I know my wife used to hate it when the kids were little and they would barge in the bathroom when she was taking a shower. She was happy to have an obscure glass enclosure during those years.). When you get home from a long day of work on a cold winter night it can be SO relaxing to crank up the heat in the shower and decompress in the confines of a shower enclosure. 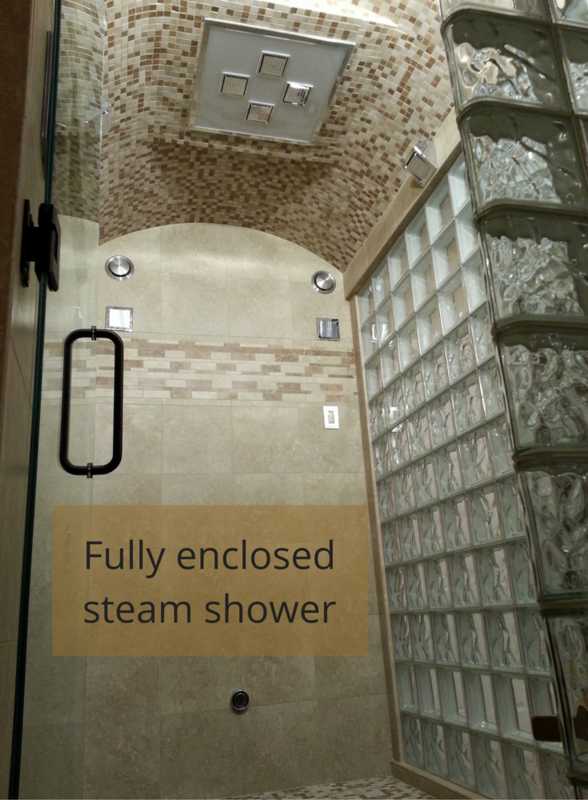 With an open shower some of the steam will logically find its way out. Some people with open showers combat this challenge by adding heated floors to balance the scales of steam leaving the space. I’ve already had to replace the cheap framed shower door the builder put in with a semi-frameless system at a cost of about $1,600. As I’m getting older I’m becoming more of a minimalist guy and desire more simplicity. Maybe that’s why I also got into the home organization business! I’m OK with the open shower (and my lack of a 6 pack abs – or even 1 ½ pack abs). I’m hoping my wife will join me in this open space! I hope this article has given you a few new points or counterpoints despite which “side” of the walk in shower aisle you’re on. If you have any questions about these systems or need help with a bathroom remodeling project please feel free to contact me – or one of the people on my team – at the numbers below. It would be our honor to help you! If you’re looking for more information or an estimate on remodeling a shower or call Cleveland Design and Remodeling (216-658-1280), The Bath Doctor in Columbus (614-252-7294) or for nationwide supply Innovate Building Solutions (877-668-5888). Open showers don’t just let the steam out, they are drafty, drafty, drafty! Also, did I mention that they are drafty! As a remodeler, I have done several open showers and ALL my clients, even though they love their showers, say they would not do it again. Even after being warned up front, they all chose trend over function. My job as a contractor is to inform my clients of all the pros and cons of certain design choices and leave the final decision to the one paying the bill. It is bitter sweet to have someone come back and say they wish they had listened to you. Hi Mike: Need your help/advice. We had a friend turn our old tub/shower combo into a wonderful walk in shower. It works beautifully for us and our needs. However, when we have family over they tend to take longer showers…..the almost level sliding door cannot hold all the water that is falling……outside of putting a “govenor” on the shower head is there a way to install a “lip” of some type? Pam – I’m glad you found the article of value. When you go with a one level wet room type system the shower can be literally any size since you’re waterproofing the entire bathroom. The question depends on whether you’re looking to use a glass enclosure and then what type of glass enclosure you want to use. Feel free to call us and we’d be glad to “fill in the blanks” for your specific project! great article. what is the minimal size that a doorless shower should be? Thanks Chris – I love the open walk in showers as well! Another excellent read! Thanks for the info, and I couldn’t help but agree with you about the open shower!